Kids see the keyboard very differently from adults, and for them, it’s a bunch of random characters. This is why we focus on mapping the keyboard first. It helps the kids to make sense of it and effectively find and memorize where the keys are. Now let’s take a closer look at it; we’ve built three games as stepping stones to hit the first goal. Keyboard Builder game is an exciting start of our journey together. The game teaches kids to see the keyboard in different color blocks, let us explain the idea behind that a bit. Think the keyboard as a world map. You might not remember Uruguay’s exact location. But wait a minute, doesn’t it belong together with Argentina and Chile? That makes it already a lot easier to locate the block in South America, right? The same rule applies to the Builder game. Letters are arranged in nine, logical color groups each group containing three letters. Believe us; this makes it a lot easier to remember the locations. Ready for the next steps? Step two is about the right eye movement, and the Frog Pond Patrol game will help with that. The big idea behind the game is to train the young eyes for the right movement, which is a sweep through the keyboard to help scan a bigger portion of it. Learning this makes finding the keys a lot faster than searching row by row. It also supports the first step and speeds up memorizing the letter groups. This step is to deepen the memorizing of different letter groups. Cupcake Bugs game challenges the kids to actively remember letter series and their locations. Letter series will help to find a place for each, individual letter. This is a huge help for the young learners to memorize actively where each letter is located. After playing these first three games for a few hours, kids are already quite far along on a journey to effective typing. They are able to memorize letter groups and use the right eye movements to do so. But it’s just the beginning. 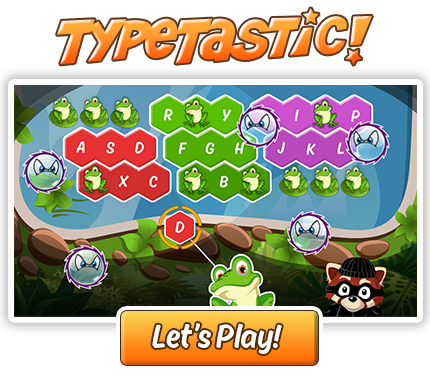 In the following games, they’ll jump on the keyboard and start typing! Can’t wait to see you there!